Reading Between the Wines Book Club: Tears of the Rose author Jeffe Kennedy Interview & #Giveaway! 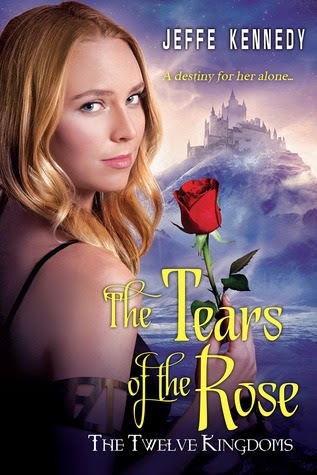 Tears of the Rose author Jeffe Kennedy Interview & #Giveaway! Today we get to have one of my favorite authors back for book two of The Twelve Kingdoms release! Welcome Jeffe Kennedy! Lexi: We met in cyberspace, Jeffe was prepared with wine-Yellow Tail Big Bold Red (which suits her, she is one bold woman). This was perfect as we were talking about her new fantasy release, The Tears of the Rose. Book two, so I had to ask if this one was different and if she celebrated! Jeffe’s reply: She doesn’t do much to celebrate book release dates, she may treat herself on the day she finishes a draft or signs a book deal. (we will have to remedy this, or at least celebrate for her) The Tears of the Rose was different as it was released right before Thanksgiving. The wonderful part: the book received great RT reviews! Lexi: The Tears of the Rose starts out with Ami, the youngest sister, seeing her dead husband’s body. If you read The Mark of the Tala you will remember that Amelia is the pretty one, more concerned with dresses and looking perfect than anything else. What was your biggest challenge with writingAmi’s story? Jeffe’s reply: This book was more difficult because of the heroine. She starts out in a dark place, she is vain and spoiled and alone. The challenge was to take the reader along Ami’s journey of transformation without losing the reader’s interest. Lexi: I have read The Tears of the Rose and loved seeing Ami as she changed. You don’t like her much through the first half of the book but then, somehow, you realize that you do like her and are cheering her on. And in the end, wow. I can’t give spoilers but GIVE ME BOOK THREE! What can you tell us about Ursula’s book? Jeffe’s reply: Ursula is her favorite sister. When she set out to write this series she wanted to write the fairytale about sisters, each more beautiful than the last. She always wondered about that middle sister, who is coincidentally left out of the well known stories, and that is where Andromeda came in. The pretty classic princess is Amelia, and then we have Ursula. The most complex and fearsome of the three. Her story will be released May 26th, 2015. 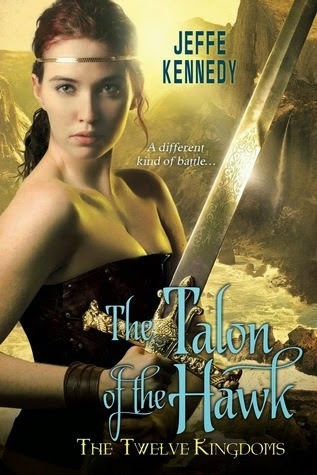 Lexi: I am so excited for book three, The Talon of the Hawk. But I am also hoping that we will get more in the Twelve Kingdoms world! Jeffe created this beautiful, rugged place full of waring kingdom’s and creatures I would hate to see it end. I begged Jeffe for some good news on that front. Jeffe’s reply: Cross your fingers, there is a chance I will get to write a couple more books in The Twelve Kingdoms. Lexi: I have my fingers, toes, and legs crossed. Until then, I am ready to go back and re-read The Mark of the Tala and The Tears of the Rose. I am going to read slow (heh, if that is possible) and find all the layered foreshadowing you have hidden away. Thanks for stopping by again, Jeffe! The only thing we love more than having you stop by, is another one of your books! Congrats on the release! 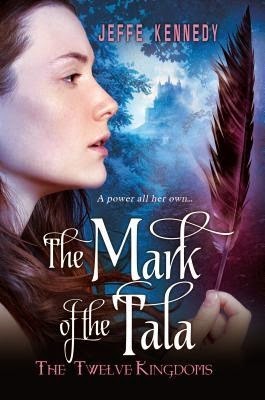 Jeffe’s reply: She was able to do some layering and leave hints in The Tears of the Rose, one of the benefits of working on the next book before the copy edits on the previous one are complete. She loves when readers find them so enjoy looking! Jeffe was as gracious and appreciative as always, and she is offering up one signed copy and one book or ebook! The book or ebook is open anywhere The Book Depository delivers, and the signed copy to a US/Canada reader. To enter, leave a meaningful comment for Jeffe. One option, do you have a favorite sister of the three, Andromeda, Amelia, or Ursula? Open until January 11th, 2015. Good luck! thank you a lot for this new interview and for teh giveaway! What glorious covers! What a challenge & achievement to turn the heroine from a vain, not very likable person to someone to cheer for. :) Waiting gave me time to pick out my own wine for the evening. I loved interviewing you as always, Jeffe! Thanks Miki - I hope you do enjoy, when you get to read! Aren't they pretty, Linda? I hope I achieved that! I have not as yet read any of these but they sound amazing. Amelia looks like she would be my fav. No favorite yet. Gorgeous covers too. I haven't read any of these books yet, but they all sound so good and I'm looking forward to reading them. I love those covers. I love to find new writers. This series sound so good. I am reading a book right now and hope to read the first one in this series next.